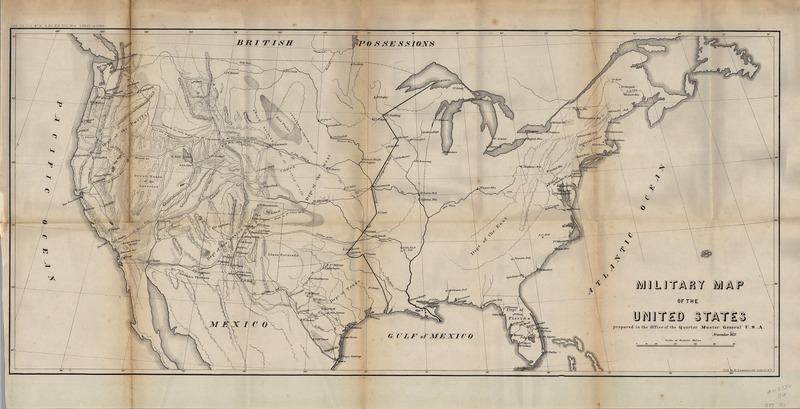 Interesting map of the United States, focusing on the Military Forts and Military Districts between the US-Mexico War and the Civil War. Shows the “Extreme Line of Outposts in 1845” and several major roads to the west. The various military Departments are named, including the Department of Texas. Also includes a number of short lived forts west of the Mississippi. The map is a lithograph by H. Lawrence for the Quartermaster General and printed up for the 35th Congress, 1st Session, in Senate Ex. Doc. 11.